Uncategorized – Pleasant Valley Preschool, Inc. Welcome to Pleasant Valley Preschool! We are a small family and community-oriented Cooperative Preschool. We have two classes: 2 Day (3-4 year olds ) and 3 Day Pre-K (4-5 year olds ). We have been operating out of the Cale (formerly Greenbriar) Community Center for 40 years. Our primary goal at PVP is to foster a love of learning. Our curriculum has been hand crafted by education professionals and follows developmentally appropriate practices. We believe that if your children are learning while having fun they will be more successful when they enter Kindergarten. When your child is here, they are fortunate to have the school all to themselves. PVP has a spacious setup, which allows for centers and areas for free play, music and movement, circle time, a reading nook, dramatic play, and art. In addition we have a fenced outdoor playground. There are two teachers and one parent helper in the classroom daily so our adult to child ratio is 1:5. 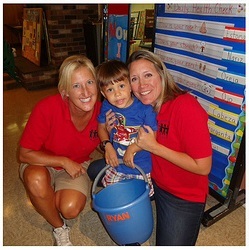 As a cooperative preschool, the children love having their family come to their classroom and join in on the fun . Our instructors have a combined 25+ years of teaching and working with young children. As the staff has had their own children attend PVP, we are committed to treating your child as one of ours. When you are at PVP, you are family. Register Now for 2019-2020 School Year! Register your child now for the 2019-2020 school year beginning January 17th. Submit your registration form and payment to Membership, PVP, PO Box 220092, Chantilly, VA 20153 or stop by our Open House from 1:00-3:00pm. Please feel free to contact our President by email at info@pleasantvalleypreschool.com with any questions. Share our flyer with anyone who may be interested: Email it to friends and family, print and post it in local shopping centers or community centers, or share it with moms groups or other meetups. Join us on Facebook to stay informed about our activities. Like us and share our posts to spread the word about our wonderful preschool!